Taichi and Chihaya take a sentimental journey. Another powerful episode of my favorite anime of the season. This one deals head on with Arata’s disappearance from the Karuta world. It also demonstrates just how one-sided Taichi’s feelings for Chihaya are. Instead of a Karuta game, episode 5 shows Karuta cards being treated disrespectfully. Taichi lays it all out in the open. Chihaya completely ignores Taichi's feelings. Poor Taichi. There seems to be a special place set aside for him in the friend-zone. 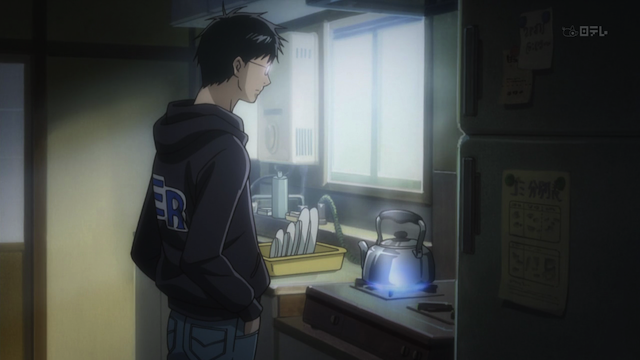 Taichi tells Chihaya that “it isn’t fun to be with someone you love”. He then tells her that he has fun with his girlfriend. Hey, Chihaya, put 2 + 2 together, will ya? No she doesn’t. She thinks he is just bragging. 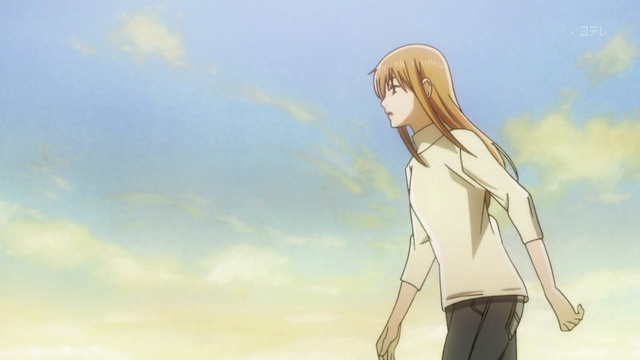 Chihaya and Taichi travel to Fukui to find out why Arata said he gave up on Karuta. Taichi keeps trying to turn it into a date. He’s moved by the sight of Mount Fuji from the train window, and the cherry blossoms still on the branch. 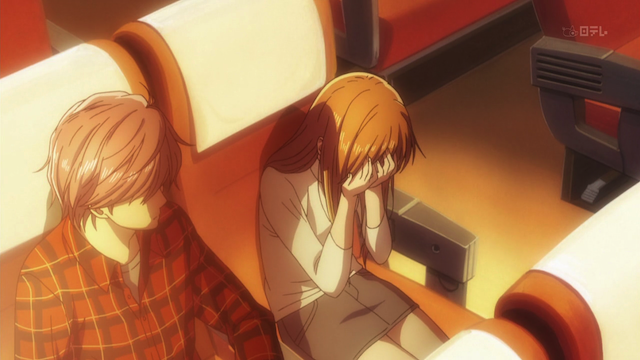 He even struggles to take Chihaya’s hand, but Chihaya is there because she misses Arata. She isn’t even aware of Taichi’s emotional state. Arata Wataya is an emotional wreck. He pushes his old friends away. 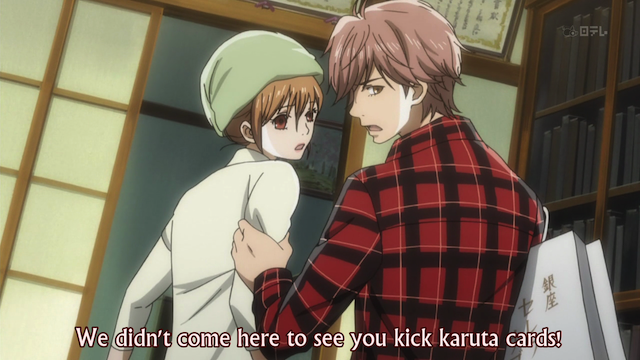 Taichi tries to protect Chihaya from Arata's tantrum. 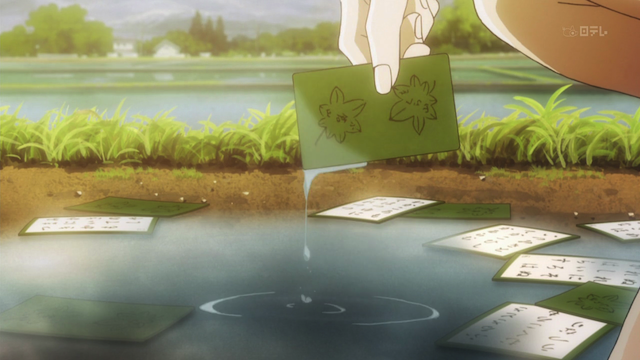 Not only do the Karuta cards get kicked, they end up in a muddy puddle. It does lead to some frank discussion. 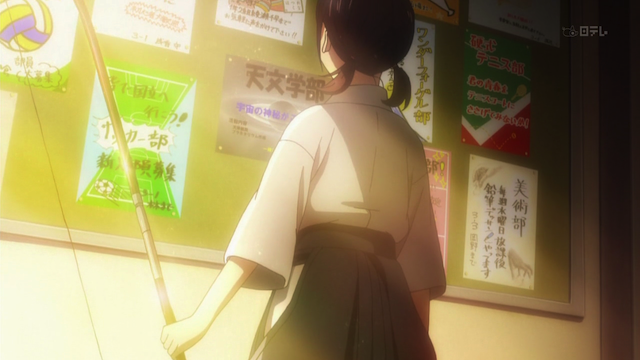 When this show started, we saw the lead character, Chihaya, trying to found a Karuta club. We had a flashback that explained why it was so important to her. Now, five episodes in, she is still struggling to get even a second member, and her hope to be reunited with her friend is dashed. There have been some reviews claiming this episode was just too emotional, but I don’t think so. Honestly, everything was on the line; Chihaya’s struggle to form a Karuta club is bound up with her wish to be re-united with her friends, and also to have a sense of self-worth. Now that dream seems to be slipping away. If there truly is a Karuta god, he would look just like Grandpa. This scene resonated with two other scenes. 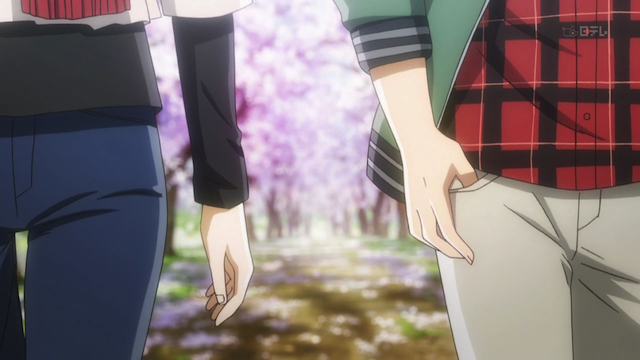 First, the hand holding is a sign of closeness that is in direct contrast to Taichi’s failure to hold Chihaya’s hand. 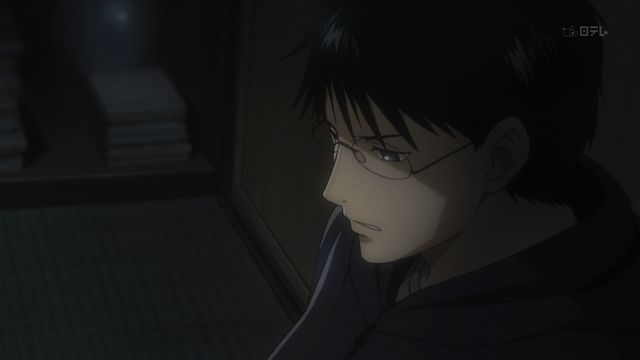 Second, the notion of a Karuta god comes up again in Chihaya’s letter to Arata, as she tells him that she thinks of him as the Karuta god, a notion that is deeply humiliating to Arata, since he feels guilt for not being there when his grandfather had his fatal heart-attack. 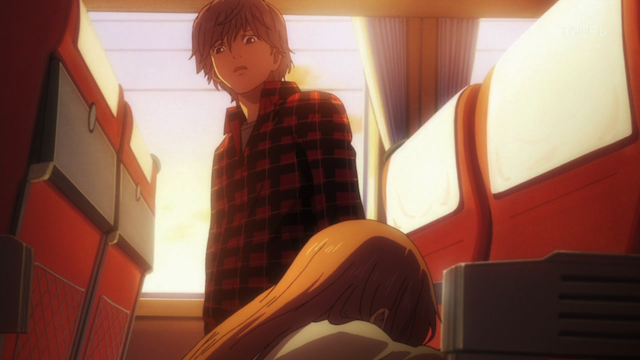 Taichi and Chihaya get on the train back to Tokyo, certain that the trip was a complete failure. 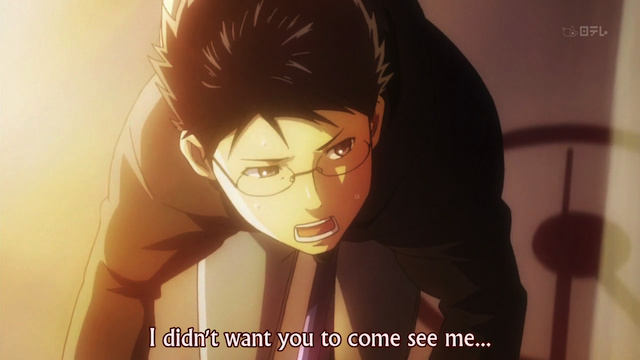 But Arata appears to let them know that he was touched by their visit. 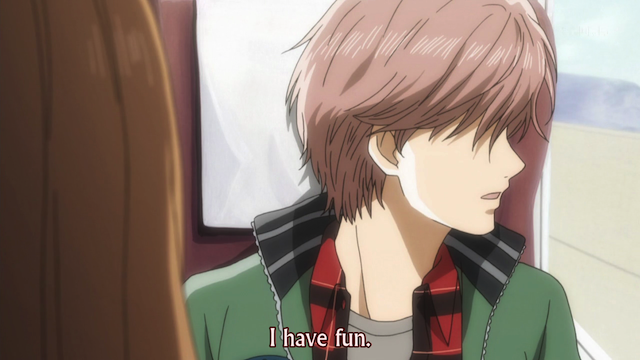 Although Taichi wasn’t able to communicate his feelings to Chihaya, he learned why she is so hell-bent on creating the Karuta club, and agrees to help her. So as the episode ends, she finally has a second member for her club. But wait! Who is this girl looking so intently at the Karuta club announcement? This girl seems to be in the archery club, which is pretty cool. Is the Karuta club finally getting off the ground? 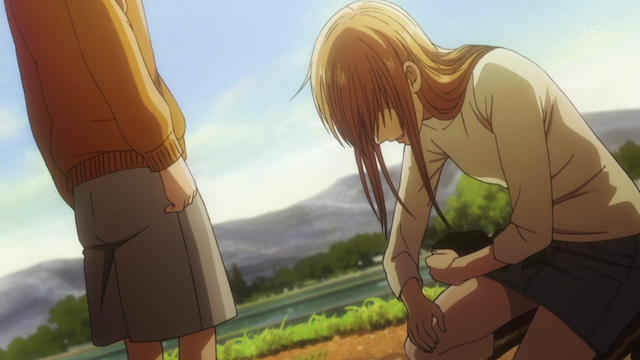 It sure looks that way, which is very promising for future episodes of Chihayafuru. Arata Wataya boils tea water. Chihaya Ayase against the sky. Another great episode. For a while there I was beginning to feel like I was getting an angst overload, but by the end of the episode, it all seemed appropriate. Considering Arata’s grandfather’s love for the game, it might seem bizarre that he would turn away from it — almost disrespecting his gramp’s memory — but people that age often respond to strong emotions in unpredictable ways. It’s a mark of his passion FOR the game that he could turn so dramatically AGAINST it. I’m going to take the radical’s role here, and predict that Chihaya will end up with Taichi (if anyone). I think her focus on Arata is entirely unrelated to romance. He represents something entirely different to her — a higher calling, in some ways, and I doubt it will devolve into simple romance. I think, when she arrives at where she’s driven to go — when she’s ready for romance — it will be Taichi she notices. But, no…I’m not willing to put a lot of money on that particular prediction. Re: Arata & his grandfather. Not to mention grief can cause people to act crazy. Re: Chihaya and romance. That’s possible. I certainly think she is not consciously in love with Arata. She is a bit emotionally naive. Even her spontaneous outbreaks are really a sign of emotional immaturity. So, yeah, she has some growing up to do in this regard. 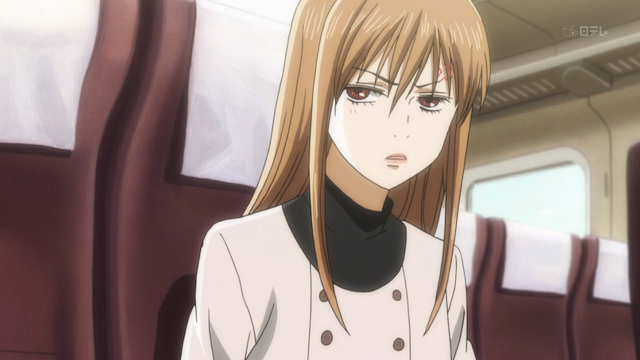 If i was Chihaya, I has absolutely no ideas who should I pick if Arata and Taichi confessed their love to me. They are just two very different people with their own charming and redeeming qualities. It is interesting how different they are. Arata seems to be a very internal person; he finds his own way to be happy about himself as a kid. Taichi is very external; he doesn’t seem to feel validated unless he is seen as praiseworthy by others. Was it too emotional? Possibly. Was it powerful? Definitely. 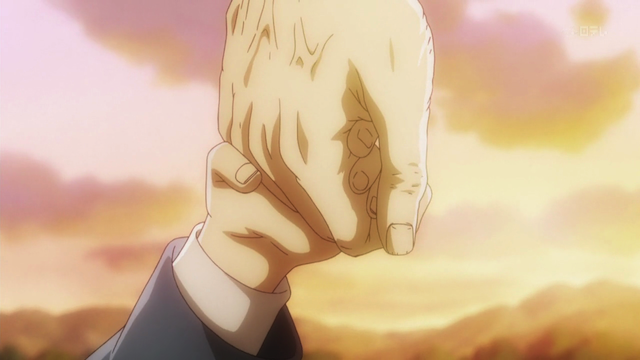 I loved the hand-holding imagery too. Taichi defo came across in a more interesting light in this episode, and Arata… Tbh, all the elements of traditional shoujo that we’ve seen so far in this show might make it sound like just another generic main-girl-is-a-tomboy-who’s-actually-really-cute+love-triangle+dorama-laden show for girls, but this show executes everything so well that I’m not surprised at how many people are enjoying this so much. Yes. It is very well constructed and produced. Even if the basic premise isn’t unusual, it is a great example of what you could do with it if you were blessed with all the right people. Absolutely my favorite of the season.